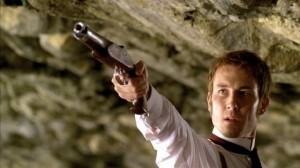 Tobias Menzies takes aim in Anton Chekhov's The Duel. Anton Chekhov’s The Duel, the acclaimed English-language film adaptation of Chekhov’s 1891 novella, arrived on Blu-ray and DVD from Music Box Films on May 24, 2011. Directed by Dover Koshashvili (Late Marriage), the movie is set during a sweltering summer at a seaside resort on the Black Sea. The story centers on the ne’er-do well Laevsky (Andrew Scott, HBO’s John Adams) and his illicit relationship with his mistress Nadya (Fiona Glascott, TV’s Clone). Laevsky has convinced Nadya to leave her husband for him, but now he wants to abandon her, which doesn’t sit too well with Von Koren (Tobias Menzies, HBO’s Rome), a former friend who can no longer tolerate the morally and financially bankrupt Laevsky’s irresponsibility. The only way for the three to maintain their honor and possibly achieve a modicum of satisfaction is for the men to engage — absurdly enough — in a duel to the death! The 2010 independent film enjoyed a limited release in theaters in the U.S.’s top 100 markets. No bonus features are on the Blu-ray and DVD, which carry the list prices of $38.94 and $29.95, respectively.